Liz Pape, the founder of Elizabeth Suzann, a direct to consumer brand based in Nashville, recently wrote a thorough post about the complexity of making ethical clothing and running a successful business in a time where consumers are increasingly price sensitive. The post, which is worth reading, as well as this follow up interview in Racked, discusses the challenges of making domestic, ethical clothing at prices that are both affordable for consumers and sustainable for brands. One of Pape’s central themes is the change in how consumers price compare products. The rise of fast fashion, she writes, has led people to compare traditionally-priced clothing (say, a $100 pair of jeans) to fast fashion clothing (where one could find jeans for $20 or less) and treat the two garments as equals on the outside, even though they are wildly different on the inside. Fast fashion, she argues, has been accelerating the pace of creation and consumption, and dragging the perception of real—not cosmetic—value into the ground. This leaves independent brands unsure of what to do, as they are making ethically sound clothing but at prices that are many multiples of their fast fashion counterparts, which disadvantages shoppers from making the “ethical choice” because they either can’t afford it or don’t want to pay for it. This is happening at such a significant level, Pape writes, that it’s unclear how a business producing ethical clothing can thrive and scale while remaining stable, especially as the sensitivity of consumers only accelerates. At the same time, consumers are spending less on clothing and apparel prices have flattened out as the prices for all other goods have risen. The U.S. Bureau of Labor Statistics uses CPI (consumer price index) to chart the change in prices for common goods a person spends his or her money on. Below is the graph of all CPI items versus the CPI for apparel over the last sixty five years. 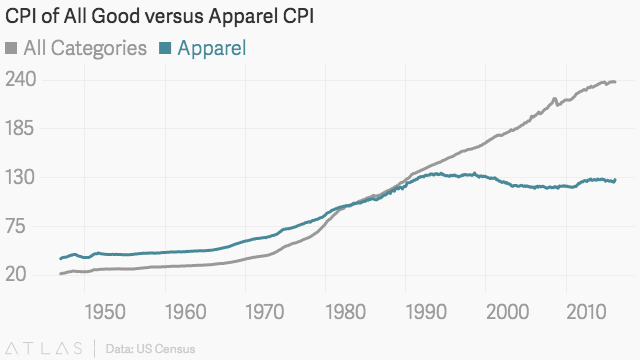 Since the late 1980s, apparel prices have fallen while the prices for all goods continued to rise. If prices have fallen, it means there is either more supply or weaker demand, which implies that shoppers are paying less for those products. It does not necessarily mean people are buying less in terms of purchase frequency. Rather, they are devoting less of their incomes to fashion and apparel. What follows is both an explanation and a solution to this phenomenon. If brands want to thrive, they need to do so either by accepting or changing this landscape. Why have apparel prices fallen while other goods are more expensive? First, the explanation. I would attribute these CPI results to two factors. First, it’s no coincidence that the flatlining of apparel price growth maps very closely to the rise of globalization. In the 1980s, some apparel brands starting moving production abroad, and the passage of NAFTA in 1994 opened the floodgates as it eased most of the restrictions and tariffs on importing foreign goods. So prices flatlined and fell, which explains how consumers can spend less but consume more, since we as a world are producing and consuming more garments than any other time in history. Second, prices are like gravity; they have a natural tendency to get pulled south, not north. Since fashion and apparel is traditionally a very high margin industry (compared to food or technology, besides Apple products), there’s an opportunity for companies to come in with lower prices and quickly take over marketshare. As Jeff Bezos is fond of saying, “Your margin is my opportunity,” meaning an industry such as fashion and apparel with 50-80% margins is ripe for undercutting. In a somewhat ironic way, the greediness of brands that took advantage of globalization to lower their own costs and increase their margin left an opening for the fast fashion brands to undercut them on price and out-execute them. This sent many of the brands falling behind into a death spiral, as they were producing inferior products at superior prices—the opposite of what a company should do. These mass retailers were then forced to put items on sale, further diminishing brand value and driving the promotional landscape that exists today, where consumers want products for less and less. Even as people spend less on clothing in raw dollar amounts, they are still buying more stuff than ever before. This is the environment that fast fashion has both created and thrived in, as it’s perfectly tuned to higher frequency shopping (people shop at Zara around 17 times a year, compared to 3-5 times for most brands) and cheaper products, often at a fraction of the cost. I have a lot of empathy for Pape’s situation, since I encountered a lot of the same challenges when I was running my menswear line. Finding price elasticity was always a challenge, and mis-pricing items (often too high, not too low), can be very problematic. I have no doubt that many other independent designers and emerging direct to consumer brands are facing similar struggles. But the only way to fix this is to make it economically viable for consumers to do the right thing, which, in this case, is buying ethically-made clothing. The economics need to align with the morality. For example, the price of solar energy, which is infinitely cleaner than oil, gas and coal, has fallen drastically over the past decade to the point where it’s becoming cheaper in some parts of the world to use solar compared to fossil fuels. People, who often want a cheap or the cheapest option, are increasingly incentivized to use solar because it makes economic sense. Coming back to apparel, the conundrum Pape lays out is that a customer is looking at a $240 pair of ethically-made pants and comparing them to a $10 pair of pants from a fashion brand that were likely produced in a foreign country with unknowable labor conditions and lower quality materials. She introduces the idea of cost per wear (CPW), which is the cost the item divided by the number of times it’s warn. I think (perhaps controversially so) that shopping from ethical, high-quality brands actually is affordable for most with nothing more than a mindset-shift. If we take the simple concept of cost-per-wear into consideration, a $10 H&M tank that loses a strap after three wears is, at best, a $3.33/wear investment. My Clyde Pants (I have the first sample pair I ever made in late 2014) have been worn a minimum of 100 times over the past two years. With a retail price of $245, they’re currently at $2.45/wear, and have at least two more years left in them. Pape says that bridging this perception divide is possible if consumers shifted their mindsets. I’ll go a step further. Brands should not just put this on consumers, but actually shift the psychology behind their pricing by reshaping their pricing schemes and vastly lowering the entry point for consumers to do the right thing. Pricing, at its core, is about psychology. Instead of presenting a price of $245 for a pair of pants, which would lead to sticker shock for many, why not present the price in fast fashion terms by amortizing the cost over a period of time? What if this same pair was presented as $22 a month for 12 months, allowing a customer to pay it off over the course of a year or six months along with a little interest. (She of course could always pay full price if she wanted.) Given the perception problems the apparel industry has right now, it’s full of opportunities for a psychological evolution. Food makes sense as a one-time purchase. One eats it and it’s gone. But ethically-produced clothing that is meant to last should be in the owner’s wardrobe for a while. This pricing perception shift has two effects. First, aligning the payment structure to the intended outcome might incentivize the buyer to wear it for a long time since she would be paying a off a slice of the price over a range of months. Second, this also disincentivizes the behavior of buying lots of cheap products and wearing each one or two times. From a consumer cash flow perspective, this pricing shift makes buying something that lasts nearly identical to buying lots of cheap items. The power of shifting perception cannot be understated, and one of the more telling success stories took place in airports a while back. Traditionally, people would get off of their flight, walk a minute or two to baggage claim, and quickly get irritated at how long it took to get the luggage from the plane to the conveyor belt. Complaints about the lack of urgency and speed were high. The airports knew that they couldn’t make the bags travel faster for a number of reasons (akin to how ethical clothing can’t get cheaper while still being ethical), so they needed another solution. In the end, they decided on extending the walk to baggage claim, shifting the perception of how long it took to get the bags off the plane and into a passengers hands. The complaints fell to record levels. Perception is powerful. Where else has this pricing model worked? Funny enough, this model is how many people have purchased the most successful product ever made, which is also the most successful luxury product ever made: the iPhone. As of this past summer, Apple has sold over one billion iPhones, many of which take advantage of amortized pricing as a feature, not a bug. Most people don’t realize that the current entry level iPhone 7 costs $649 if you walked into the store and just bought it. Instead, Apple and phone carriers let customers spread this cost out in monthly payments of anywhere from around $20 to $50 a month per phone, amortizing the cost over a year or two. This instantly makes the phone much more accessible to everyone, compared to forcing people to pay $649 up front or forget about ever owning an iPhone. Apple and many carriers charge 0% interest, and while others might charge interest in the low single digits, any costs on this front to the consumer are rather marginal. Additionally, many other industries have adopted this model. The furniture world is familiar with it, since it’s common for people to finance multi-thousand dollar purchases and spread the cost out over multiple months. (Design Within Reach, for example, offers a credit card with no interest if purchases are paid off in the first six months.) The same goes for appliances and electronics. Affirm, the modern credit company started by PayPal co-founder Max Levchin, powers this feature for companies like Casper (mattresses) and Peloton (spin bikes and classes) and it makes perfect sense. High quality clothing can be as expensive and impactful as furniture and appliances, and the same model could work. Importantly, this pricing method should not have any effect on brand equity or perceived value. Under this pricing scheme, the customer still has to pay the full price. Items are not cheaper; the payment method is just a bit clever. If I could buy an Acne coat that costs $800 and spread the cost over eight months (at let’s say $108 a month with interest) that is a much more reasonable entry point even though I’m still paying over $800 all in and I’m still an Acne customer. Often times, it’s not that customers can’t afford the item, but that they can’t afford it all at once. This both lowers the barrier of entry for customers while widening the addressable market for brands. It’s entirely possible for a brand to still get paid while also increasing its customer base, especially if it’s using a third party like Affirm to facilitate this feature. Although Affirm and its ilk charge merchants and consumers a small fee, the merchant is getting more sales than it would without it and the consumer gets to own something ethical they otherwise might not buy. Importantly, the merchant gets paid in full once the transaction is completed and Affirm assumes all of the risk of repayment. If the fashion industry wants consumers to shift towards more ethical consumption—I would argue that this needs to happen—brands must act first by reframing their offerings. Putting it on consumers to adjust their mindset without signaling an intended outcome only leaves rooms for uncertainty. There are a growing number of tools available for brands to experiment with changing their pricing perception. I hope fashion and apparel brands of all types jump on this opportunity to actively improve their own, as well as the planet’s, chances at survival.